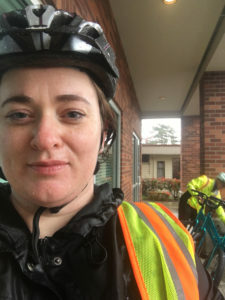 GRTMA team member Sara Robinson braves a rainy Saturday to learn to bike. At 4pm on a really rainy Saturday in April, I was wet and cold and grinning like a little kid on Christmas. I was plotting ways I could get on a bike more often, when I could pull my bike out of mothballs and get a safety check. Like just about everyone in the class, I hadn’t spent a lot of time on a bike in the last few decades. I first learned to ride as a six year old, but my little sister was the brave, sporty one and quickly outpaced me. I felt confident rolling down our sloped driveway but would let my momentum carry me and then I walked the bike back to do it again. This was enough for me even though my sister and her friends were going on ‘adventures’ on their bikes. A few years later I got back on my now too small bike and discovered I had magically figured it out. I could balance and actually pedal to keep the bike going! I talked my parents into a new bike and got myself to middle school and high school on that bike and had my own ‘adventures’ with my friends for a few years. Eventually I got my license and stopped riding: it wasn’t the ‘cool’ thing to do as a teenager. When Go Redmond announced that they were bringing back the Adult Bicycling Class, I was excited: the trails here are great and I already do so many of my errands on foot, going by bike would be that much easier. Plus I actually work on Tour de Redmond so… I should probably get used to riding before I try to commute, at least part of the way, from Renton. I had so much fun getting out on a bike again in a friendly and safe place (where I wasn’t the only person to admit I didn’t have a clue how the gears work). This week I learned some really basic stuff that no one had ever told me before: how to start strong, stop smoothly and, yes, how and when to shift gears. There are still spaces in the upcoming classes, and you can sign up here. Classes, taught by certified League of American Bicyclists Cycling Instructor Brian Watson, are “Start Cycling” for those who have never ridden (no shame) and “Go by Bike” those who haven’t been on a bike in a while, and in September Brian is going to be teaching Urban Cycling: Intermediate Bicycling. I’m still excited and took a ride today at lunch with one of my Tour de Redmond veteran colleagues, so you can be sure I’ll let you know how the next few weeks of classes go. Until then, did you know that you can earn a $20 gift card to REI right now with #GoGREATER? Share the story of how you #GoGREATER when you log a trip on GoRedmond.com. Check out the “Available Rewards” tab to learn more.